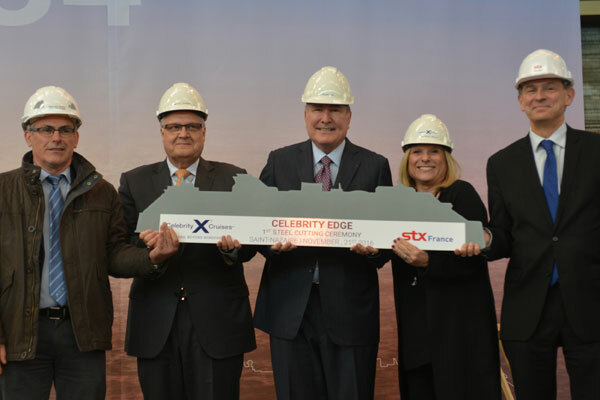 Celebrity Cruises just celebrated the steel cutting of it’s newest class of ships, the Edge-class. They also announced that the ships will be named Celebrity Edge and Celebrity Beyond. Now currently under construction at STX France, the ships will be an entirely different class of vessels for the Royal Caribbean brand. Both the Edge and Beyond appear to be smaller than the Solstice class of vessels, carrying just 2,900. The Edge will debut in 2018 and the Beyond in 2020. There will also be two more Edge-class vessels that will debut in 2021 and 2022. In the above image we can see a rough outline of the new vessels.